So, you want to sell your small business? The good folks in Washington have a dandy tax break exempting you from all federal taxes on the sale—provided that you own a C corporation. A lot of attention has gone to the special "pass-through business" break from the new tax law. This benefits income from S corporations and others like it, giving owners a 20% exemption on their business' earnings. 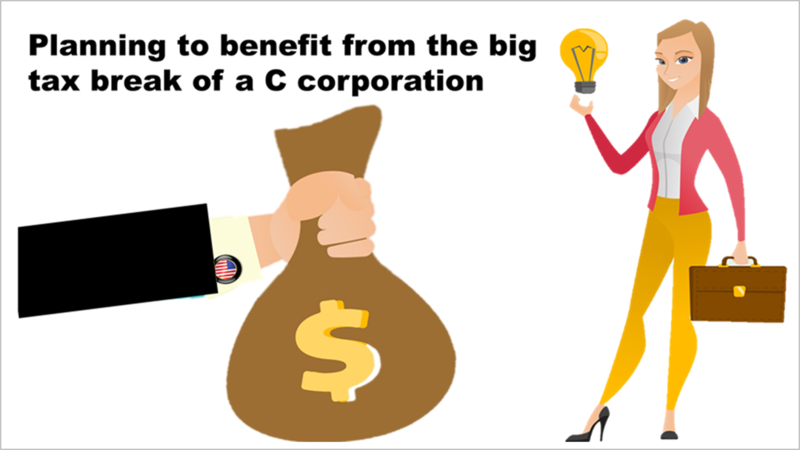 That highly popular provision in the Tax Cuts and Jobs Act makes it seem like small business owners would be idiots to classify their company as a C corp.
Well, except for the terrific advantage you get as a C corp seller, which has been available for many years. Aside from the TCJA exemption and the lack of double taxation, C corps are taxed at the corporate level and then the owners get taxed on what they reap after that. In contrast, pass-throughs, like S corps, LLCs, and other partnerships, are only taxed once. C corp shareholders pay zero tax on a company sale, as long as they acquired the shares on or after Sept. 28, 2010. That's a huge tax break! The gracious 100% tax exclusion is available to anyone with stock in a C corp for over five years. Taxpayers get a smaller break on shares owned before Sept. 28, 2010. You're also entitled to a 5% exclusion on C corp shares owned from Aug. 9, 1993 to Feb. 17, 2009. C corp shares purchased between Feb. 18, 2009 to Sept. 17, 2010 receive an exclusion on 75% of the gain on the purchase price in the event of a sale. If you owned your C corp shares prior to Aug. 9, 1993 date, you're out of luck. To get this tax-favored status, called a Qualified Small Business Corporation, or QSBC, a small company must meet a batch of requirements. The business' gross assets must be less than $50 million, and the exclusion is capped at the greater of $10 million or 10 times the aggregate basis of the stock the taxpayer sold during the tax year. Say you sell your business for $10 million. If the QSBC break didn't exist, and your capital gains rate is 23.8% (the top rate of 20%, plus a 3.8% surtax for singles making more than $200,000 annual or couples hauling in over $250,000), you'd owe $2.38 million to the IRS. But thanks to the QSBC benefit, you'd owe the government zilch. And here's a kicker. Both C corps and pass-through businesses are helped by the new, lower federal tax on companies, 21%, down from 35%.